Who can’t identify with these concerns? What surprised me is that my biggest challenge wasn’t even mentioned in the study, and it’s a problem shared by all of us. People aren’t reading. I’m only half joking when I tell people I spend my day constructing words I know people won’t read. If people aren’t reading – and we know even avid readers are deluged with far too much information to digest – we have to depart from the tactics of writing to attract them. What makes people stop and take notice? Design. If you’re not convinced that design is critical in the content process – or you are trying to convince someone in your organization to make an investment in design, here are some thoughts and an example to use when making your case. The battle starts before anyone opens your document. Conduct a Google search on “how to write a headline” and nearly 16 million results are returned. Why? Because a good headline – much like curb appeal in the real estate industry – encourages people to take a look inside. Once you know the basics are covered off, the next step is to evaluate whether the techniques you’re using are actually improving your content. They’re only useful if someone has decided to read the written text. Wouldn’t your customers benefit from an approach focused on convincing people to read in the first place? Publishers and product developers use design strategically because humans are visual creatures. Faced with choice, the document (or product) with the best design features will be selected first. Publishers figured out long ago that the book jacket had a massive influence on book sales. Album covers were considered an art form. Apple’s success comes, in no small part, due to the aesthetic appeal of their products. Yet none of these design features has any bearing on the quality of the content. So ask yourself: how can design help your content? We need to stop focusing on what we’re saying and start thinking about what we’re delivering. The goal of content marketing is to persuade someone to answer a call to action. While we can format our content to coax readers through a document, it’s of no use if it’s never opened in the first place. Collaborating with a good designer will give your content a competitive advantage for success. As a writer, I’ve always been content-driven. When I started my company, I designed and printed my own business cards. I had worked in enough places to know how I wanted them to look. How hard could it be, right? As a member of the Australian Computing Society (ACS), I included their logo on my card since I planned to work with software companies. I was impressed with my effort. I agreed to let him design something for me on the condition I wouldn’t be obligated to purchase. In an irritating display of confidence, he agreed saying I would change my mind when I saw his idea. He was right. I was amazed at the difference. The content was basically the same but the product had changed completely. I immediately agreed to invest in his idea. Ryan clearly understood what I was trying to achieve with my business and used professional design techniques to convey that. 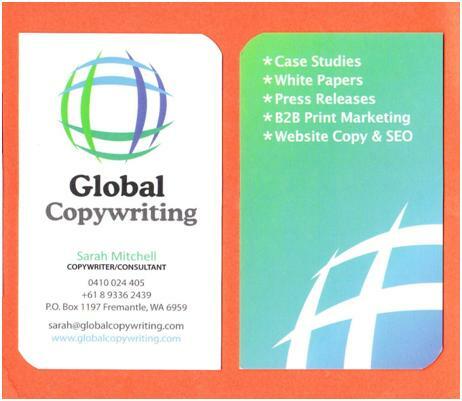 My new business card looked great but also did a better job supporting my business. Working within a space of 2×3.5 inches, my card quickly became an asset even though the content hadn’t changed significantly. 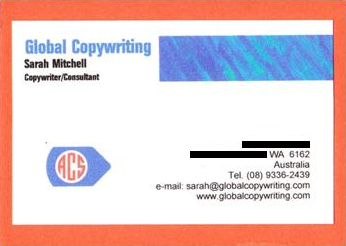 In addition, putting international dialing codes on my phone number helped to position my business for work outside Australia and reinforced the “global” in Global Copywriting. For another example on how good design improves content, read my earlier post, Get Inspired: How a Clever Design of an Email Banner can Improve Content. One good experience with design didn’t convince me to adopt it as part of an overall content marketing strategy. Over the past two years, I’ve come to realize that when design is a considered part of a project, the content is more effective and produces better results. I’ve come to respect the value of design in a project and prefer to work in collaboration with a designer whenever I can. A truly strategic content marketing campaign should give equal consideration to the design of the content as much as to the substance of what’s being said. Until we can deliver substance in an attractive package, we’re not truly creating an asset for our clients. Where has design made a difference in your content marketing?